In shoeing horses it is often the case that some horses go lame as soon as the shoes are put on, and the horse is all right as soon as the shoes as the shoes are pulled off again. In examining the feet of such horses it will be found that there is a weak low heel. Weak-heeled horses have, as a rule, wide flat feet, low heels, soft and sensitive balls. The reason why a horse with this kind of feet goes lame when shod by the average shoer is twofold. 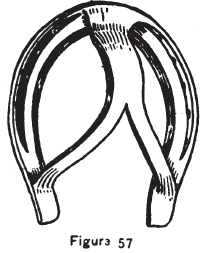 First, the shoe is allowed to rest too hard against the weak heel; second, the nails have been tightened too hard, drawing the flat foot down against the shoe and causing pain in the tissues connecting the horn with the sensitive laminae of the foot. In shoeing, make a shoe with a heavy web, and set it so that there is no bearing on the heels. Do not draw the clinches hard. The shoes should have sharp calks to take up the jar and prevent concussion. An open bar shoe with some frog pressure can, in this case, be used with advantage. Flat foot is not the same as “drop sole.” This is another thing entirely, and is termed “pumiced sole,” under which head it is treated in another chapter. Many kinds of shoes are made even for flat foot. Some have springs in them to rest on the frog, but they are not practical, and sometimes they cost more than the horse is worth. It takes more time to make this kind of shoes than both the blacksmith and his customer can spare, and when it is made it is only a cunning device, good for little or nothing, that will last for a month and then it must be made over again, which repeated performance the horse owner soon tires of. It must be a horse worth a thousand dollars to be worth the trouble of making such shoes. What we want in this case as well as in all other instances, is a practical shoe, easy to make and cheap enough for any horse. On heavy draft horses with brittle hoofs it is difficult to place the shoe so that it will stay on for the required time. The reason why the shoes come off is the brittle condition of the hoof, which breaks out in pieces, or else the nails pull out through the holes, which wear large. In such cases a shoe with toe clip should be made. The shoe should be fitted snugly to the foot. When the foot has been prepared and the shoe made, heat the shoe all over to a red heat, then press it quickly to the foot. This will give the shoe a perfect bearing which is essential in every case, but especially with brittle hoofs. Drive the nails deep to get good clinch holds. Stringhalt, or springhalt, as it is sometimes called, consists in a spasmodic jerk in the hind legs, sometimes only one leg being affected. In some cases the jerk is more violent, the foot striking against the belly. In others the jerk is only a few inches high from the ground, but always the same spasmodic jerk. In some cases it will only be noticed when the horse is backed out of the stable, in others it is worse when the horse is started. Then he will jerk first one foot up and then the other and so on for a while, but when once started he will walk all right. There are different opinions in regard to this disorder, but the majority seem to be in favor of the belief that it is a nervous disorder. There is so far no cure known for it. If it is a local disorder in the leg, bathing the quarters once a day in cold water for two weeks may alleviate the jerk. If not, try warm water. Rub the quarters dry after bathing. The displacement of the patella is generally known to horseshoers as “stifle.” In cases of this kind an experienced veterinarian should be called, as mistakes are often made in regard to this trouble. Cramps of the muscles of the thighs are sometimes taken for stifle. This displacement of the patella may occur in many different ways, as by falling, or slipping in rising in the stable. In most cases the cause is weakness and general debility, and in some instances it is brought on by lack of exercise. When a stifled horse is brought to the shop for shoeing, I would advise the farrier to first try the following method, and if it fails to bring the stifle back, the animal may be shod for stifle: Tie a rope around the ankle of the affected leg and pull the foot forward; now hold the foot in this position while one man pushes the horse over from the opposite side, so as to make him stand on the stifled leg, at the same time a third man should place his hands on the stifle and push it forcibly inward, and at the same time forward, so as to force the stifle back. If this manipulation is successful there is no need of shoeing the stifle. If is not, proceed to shoe as follows: Make a shoe as shown in Fig. 57. This shoe is intended for the foot of the well leg. It will be seen from the shape of tis shoe that the intention is to put on a shoe that the horse cannot stand on. The horse is then compelled to stand on the stifled leg, pressing the stifle back with his own heft. As soon as the stifle is back in its place remove this cruel shoe. As soon as the stifle is back in its place the horse will see to be all right, and the animal may walk or trot without any sign of lameness. The trouble may, however, return at the slightest provocation, the muscles being weakened it comes on easier after each performance, and the trouble gradually becomes a habitual weakness. Seedy toe is a dry rot at the toe of the foot, extending up between the wall and the laminae. It is caused by hot dry roads, or striking the toe against the pavements. It is sometimes the result of toe clip in the shoes. Remove the shoe and pare away any dry and mealy substance. Cut down the toe so as to take away all bearing from the toe against the shoe. Apply hot pine-tar, and fill the hole with a wad of tow dipped in the tar. The toe clips should be cut off, so that there will be no rubbing against the toe. Pricking, or punctured wounds, are very common, and probably the most serious injury to the foot. Horses are pricked in many different ways: by nails, slivers, sharp stones or anything that will penetrate the sole and injure the foot. This trouble is more dangerous in the center and fore part of the foot than in the heels. If the horse is pricked by shoeing, pull the shoe off and examine the nails. The nail which has gone into the quick and caused the damage is generally wet and a bluish color. If this pricking has been deep, the first evidence of its existence may be the discharge of pus at the coronet. In such a case the lace of pricking should be located and the horn cut away so as to give the pus a chance to work down. When the diseased parts have thus been exposes, the foot should be put in a boot of linseed poultice for a day or two, until the lameness and suppuration have disappeared. If the horse has been pricked so deep that the coffin bone has been injured, serious complications may follow. Cutting the horn away will often be found a difficult task with suchc tools as are at the command of the farrier. The foot being very sore the cutting must be done with a sharp knife. Most horseshoers sharpen their tools with a file. This makes a rough edge, which will neither work easy nor cut keen. 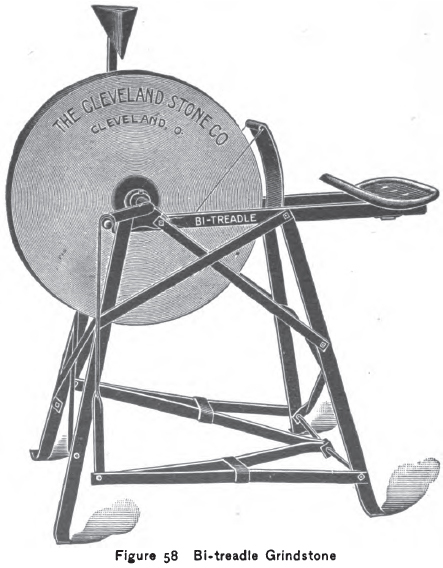 Every shop should be equipped with one of the Cleveland Stone Company’s bi-treadle grindstones. (See Fig. 58.) Even for ordinary shoeing the work is made easier and the workman who keeps the best tools is the one preferred. In shoeing for pricking, use rubber shoes until the foot is sufficiently healed to stand iron shoes.